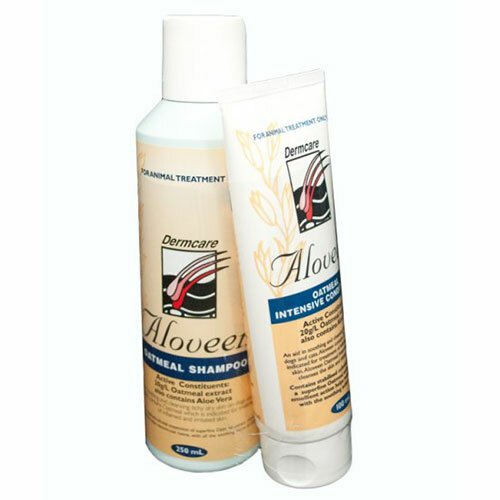 Aloveen Oatmeal Intensive Conditioner effectively cleanses and detangles dog hair. It soothes dry and itchy skin on dogs. 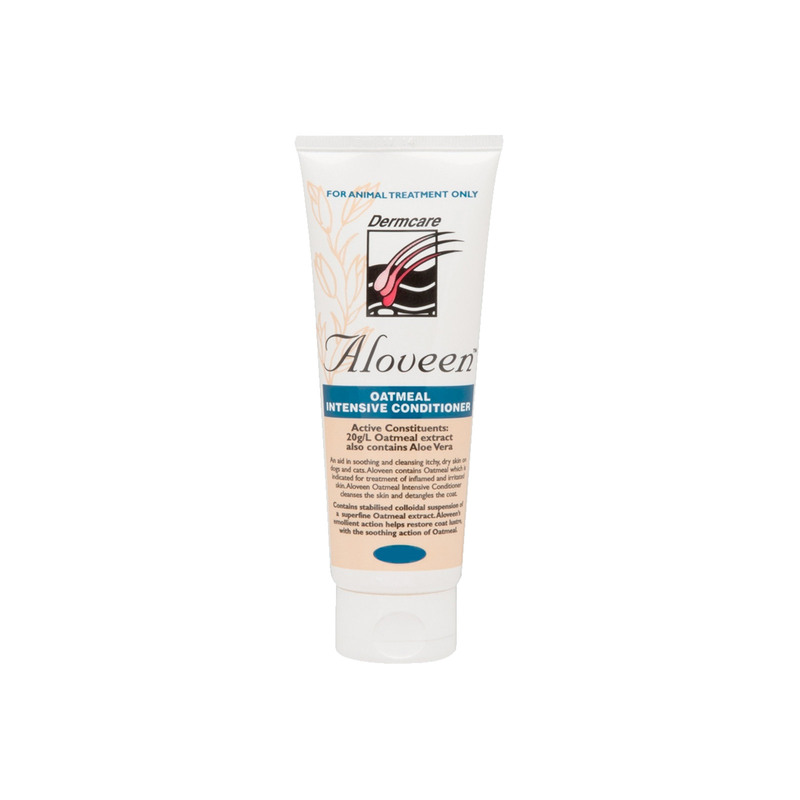 This conditioner is also indicated for the treatment of inflamed and irritated skin. Specially designed to leave on the coat after Aloveen shampoo, the pet conditioner makes the coat soft and smooth. Aloveen Intensive Conditioner contains stabilized superfine colloidal Oatmeal in an Aloe vera gel base. These natural ingredients deeply condition pet fur. It removes itchiness in dogs and helps to maintain natural moisture keeping skin smooth and shiny. Use this product after Aloveen Oatmeal Shampoo. After shampooing, rinse the coat properly with water before applying Aloveen conditioner. Apply the conditioner on the animal coat at several points. Gently massage onto the coat. Lightly rinse off with water or use as a leave in conditioner. Dry and brush the coat as usual. Acts as an excellent fur conditioner. It helps to restore natural skin moisture and keeps it supple. 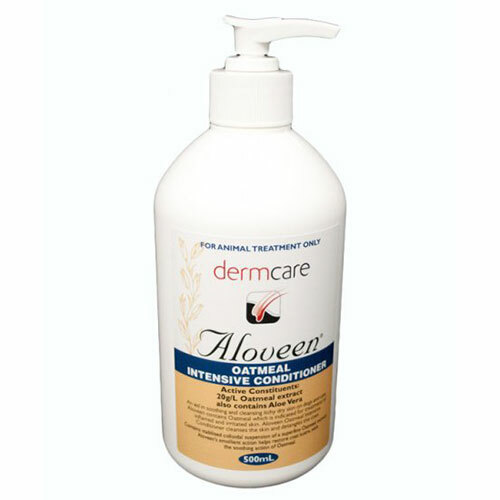 Aloveen Oatmeal Conditioner makes pet’s fur shiny and glossy. It easily de-tangles and makes fur smooth. With the soothing properties, it is ideal for pets that have itchy and scaly skin. A perfect product to be used after Aloveen Oatmeal Shampoo. No contraindications seen of using this product. My dog's skin has gotten super smooth after using this conditioner. It is so perfect for him that I cannot even think of using any other product now. I use this product regularly for my dog. Greatly works for his itchy skin and coat. After using his fur feel softer and healthier. Great smelling. Overall, it’s worth every penny. We really liked this Oatmeal Shampoo it has a great scent and that it also helps with the grass allergy my dog has. Hes stopped scratching himself. For smooth coat and really good shine, I go for Aloveen Intensive conditioner. It provides smooth touch on fur and keep my two teddy's skin shining. and is available at great prices at vetsupply. Perfectly goes with my dog's coat and add bounce to the hair. Happy for the product.